A log of what changed with each new version from newest to oldest. Remember, G-Wizard tells you when you need to upgrade with a message in the top right corner of the screen. If you need the latest version, it can be installed from this page. We make one earlier version available via this page. - Brought GW Estimator up to date with all the GW Calculator updates to the core feeds and speeds engine. - Material ops added with option to mark up material cost. - Added Chamfer option to 2D Profile and Pocket Ops. 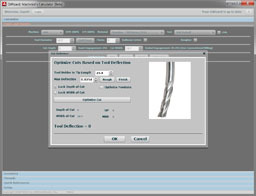 The tool is selected in the Options for Machining Ops. - Added "New" button to clear all the estimate data to create a new estimate. - Default Shop Rate defined in Cost DB and used throughout. - Fixed numerous bugs and non-working features. - Implemented "Custom" Machining Op that can do anything Feeds/Speeds can do. - Minor fixes and refinements to 0.82. - Major UI overhaul of all the op creation. - Added tapping and thread milling to the Hole feature. - Ability to either save operations with a quantity value or blow them out as individual ops. - Range selection and delete of ops using Ctrl + Click and Shift + Click. - Completely redid Op Picker UX for more efficient use of real estate and easier operation. - Op-creation window is now a non-modal that can be setup side-by-side with the list of ops in the quote..
- Bug fixes, UX improvements, and sync with latest GW Calculator Engine.